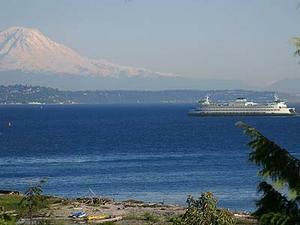 Abode On The Sea is sunny three-room 750 square foot suite with great views of Eagle Harbor, Mount Rainier and the Sound. Within the Wing Point Community near Bainbridge’s only 18 hole golf course, Abode On The Sea is an ideal spot for relaxing, a visit with friends and family, or a cozy base for a Seattle business or social visit. Charming downtown Winslow and the Seattle/Bainbridge ferry are a 25 minute walk away. Take morning/evening buses to within block of your suite, a $7 taxi, rent a local car/Flexcar that will wait for you at the ferry or walk. A 50 step staircase leads from the suite to a sandy beach where you can watch boats jet in and out of Eagle Harbor and gorgeous sunsets over the Olympics. You are welcome to enjoy the comfortable beach furniture provided for you, warm yourself in front of the beach fireplace, BBQ your meal, borrow your host's kayaks or walk on the large beach -- at low tide you can almost touch the ferry when it passes by! The suite is very cozy, light and secure. With a south facing exposure, it receives sunshine all day. It has its own private walkway and entrance to the entire lower level of a large house, a woodstove, a large eat-in kitchen with a gas stove, and an expandable dining table that can sit up to 6 people. The suite sleeps 4 adults --it is furnished with an antique queen size bed and a queen size sleeper sofa. Two more people can be accommodated with the full size fold-out bed. We also offer DirecTV satellite, DVD/VCR, fast wireless 13 MB broadband cable internet access and free nationwide telephone. We take Visa, MasterCard, American Express or check. Nightly reservations are secured with a deposit equal to 2 nights or half your stay if your reserve for 3 or more nights. The balance is due 21 days before arrival. With minimum 21 days notice, we will refund your deposit minus a $50 booking fee. With less than 21 days notice, we will do the same if we are able to re-book our suite. Ask about our weekly and monthly rates. Member Bainbridge Island Lodging Association and Chamber of Commerce.